The Boston Terrier Temperament can be summed us as friendly, gentle and lively. There is a misconception that the Boston Terrier is still a fighting dog because that’s what breeders bred them to do long ago. However, that is no longer the case. The Boston Terrier is the perfect breed for anyone looking for a family dog. He has a most gentle and loving nature. However, he does not like being on his own. He loves and enjoys the attention that he gets from his human companions to the point where he will seek it out from other members of the family if you’re too busy for snuggles. The Boston Terrier thinks of himself as being another member of the family. Another admirable Boston Terrier temperament trait is his suitability. He runs the gamut when it comes to people and animals. For instance, he is good with children and great with senior citizens. He makes for an excellent play companion for your children, regardless of their age. His sturdy build makes him less brittle. You, therefore, don’t have to worry as much about him being around younger, rougher children. He is also fine with the other non-canine pets who may live in your home. This is true so long as you train him early on to resist chasing smaller animals, like cats. The Boston Terrier does not take teasing lightly. He becomes jealous and possessive, but you can help him work through this by training him out of it at an early age. This breed is also not used to being close to other dogs. If you wish to have more than one Boston Terrier in the home, you should introduce them to one another first and while your dog is still a puppy. If you wait until he’s older, then he might become hostile and aggressive toward other dogs. And If you intend on raising neutered or spayed male or female Boston Terriers, you should raise them together while they are still puppies. This will also help them deal with their otherwise high prey drive. Watch This Funny Video of a Boston Terrier with a French Bulldog! Boston Terriers tend to be sensitive to the tone of your voice. However, this mainly depends on the mood of the house he grew up in and the quality of training he receives as he matures into adulthood. The Boston Terrier is intelligent, and so he understands your commands quickly and easily. However, you should be firm and consistent with him to get the best results. Remember: there is a difference between being firm and straight-up yelling. As with all dogs, yelling tends to yield more negative reactions than positive ones. To prevent your Boston Terrier from becoming troublesome and high-strung, you should give him adequate and regular physical and mental stimulation. Provide him with regular play sessions and take him for long walks daily. During his play sessions, you can take him off-leash, so long as you keep him in a securely fenced-in yard. As long as you can meet his daily activity needs, then he should do well living in an apartment or a house with a yard. Learn more here about the benefits of daily exercise for a dog. If you are considering bringing the Boston Terrier into your home, you should know that these dogs can live a long and full life (13 to 15 years). However, they can have their fair share of health challenges, too. Some of the health issues you may have to deal with include snoring and wheezing, mostly caused by the dog’s short face. In hot weather, these dogs are likely to overheat. Some Boston Terriers also have a drooling problem, and you may also have to deal with tumors of the heart and skin. The eyes of the Boston Terrier are also prone to injury. If a Boston Terrier suffers from bad breeding practices, he could end up suffering from bone defects in his skull. If left untreated, these defects could lead to a stunt in his development. Males are typically 17 inches tall, and females 16 inches.. The Boston Terrier came to be in or about 1870, with a dog named Hooper’s Judge, who was a mix of both English Bulldog and Terrier traits. Experts believe Hooper’s Judge is the ancestor of all Boston Terriers as we know the breed today. As mentioned earlier, the once more common aggressive Boston Terrier temperament has all but disappeared, leaving in its wake a kinder, gentler dog. However, some male Boston Terriers will challenge other males if they feel they are encroaching on their territory. Here’s a quick piece of trivia for you. The Boston Terrier is the mascot of not one but two colleges: Boston University in Massachusetts and Wofford College in South Carolina. People like to compare the Boston Terrier and the French Bulldog because they actually share a common ancestor: the English Bulldog! However, while the Boston Terrier originated in Boston, the French Bulldog actually hails from England. The Boston Terrier and the French Bulldog (or “Frenchie”) are both small dogs, though the Frenchie is significantly smaller. 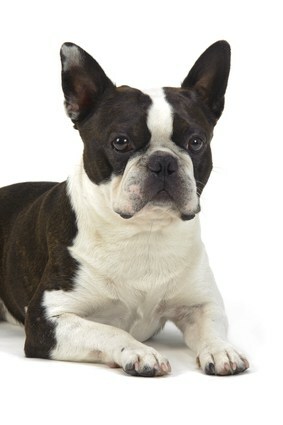 Also, you can tell a Frenchie by his ears, which are squarer and more bat-like than those of the Boston Terrier. As for their temperaments, the Frenchie is just as gentle and loving as the Boston Terrier. However, while Boston Terriers are more the gentleman in the room, the Frenchie prefers to be the clown, going out of his way to make you laugh. When training the Boston Terrier, be sure not to resort to harsher training methods. Don’t scold him when he does something wrong, and definitely, do not hit him. Focus more on rewarding him when he does something right. If he doesn’t get it on the first try, say “that’s okay,” and help him try again. Treats are a great incentive but don’t go overboard. The last thing you need is an overweight dog, as that invites a host of health problems into your lives that neither of you need. For help with training your Boston Terrier take a look at The Online Dog Trainer by Doggy Dan. Doggy Dan is an expert Dog Trainer based in New Zealand. His online resource contains Hundreds of Excellent Dog Training Videos that will take you step-by-step through the process of developing a healthy, happy well-behaved dog. For the Boston Terrier, shedding is definitely a part of life, but it’s nothing too crazy. Brush him weekly to remove any loose hair and stimulate new hair growth. Bathe him occasionally, like when he gets into something dirty or starts getting that stinky “dog” smell. And don’t forget to trim his nails regularly. Walking around on nails that are too long is uncomfortable indeed. 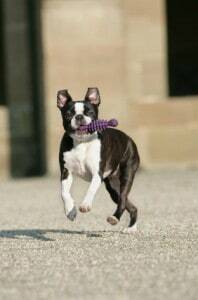 The Boston Terrier is an enigma because his level of exercise can change from one Boston Terrier to the next. While one dog will need one or two daily walks to feel like he is well-exercised, another may need much more than that to feel sated. If you leave him along for long periods of time, he can develop negative personality traits, like chewing or peeing on the rug to spite you. However, when you notice he is down, throw him a ball and he’ll pop right up, happy and ready to play. He’s a very resilient dog. Sometimes, you see a mixed breed dog, and you simply can’t resist – especially if its mix includes a breed you already love. And the names they come up with are sheer genius sometimes. Have you read all you needed to decide whether you would like to add a Boston Terrier puppy to your family? If so, then you’re probably wondering where you should start. Of course, you can always try to buy a Boston Terrier from a breeder, but you can also adopt one from your local animal shelter as well. The decision you ultimately make is up to you, but an adoption can certainly be easier on the wallet if you’re on a tight budget. The average Boston Terrier price fluctuates between $600 and $1,200. Typically, you should expect to pay around $800 for one of these dogs. However, if he comes from an exceptionally show-worthy line of parentage, you can pay anywhere from $1,500 to $4,500 for a show-quality Boston Terrier. Adoption is a great idea because it helps dogs in shelters who otherwise would not have a warm and loving home to live in. Granted, the people at the shelter love the dogs they care for, but an 8×8 cell is nothing compared to the warm comforts of home. In addition to helping the many dogs who are in need, you can also save quite a bit of money in opting for adoption over purchasing a dog directly from a breeder. Plus, dogs up for adoption, unless they are puppies, have received training, so you don’t need to worry about housebreaking them or teaching them not to chew. Adoption is also a great idea if you love mixed breeds. There are usually more mixed breeds in a shelter than the more expensive purebreds. Choosing the right breeder is just as important as choosing the right dog. The best place to start is with an internet search. Compile a list of local Boston Terrier breeders in your area, then look up each breeder to see if there are any reviews online. The reviews speak for themselves. Just be wary if you see a breeder with all positive reviews and few to no negative ones. It is possible the breeder is influencing those reviews. Once you’ve chosen a breeder, really scope out the location where the breeder keeps his puppies. Is it clean? Are they comfortable? How the breeder presents his living space will tell you a lot about whether he truly cares about his dogs. If he does, then he has gotten them the proper certifications and training. Else, he’s just out for the money. Conclusion: Why the Boston Terrier? The Boston Terrier temperament can vary, depending on the dog. While some are eager to please their masters, others can be rather stubborn. That being said, the Boston Terrier is a lovely family dog because he’s friendly, gentle, and resilient. He’s great with people young and old, and as long as you teach him to ignore his prey drive, then he can live with just about any animal, too. He hates to be alone and, in fact, will do things to get your attention if something else takes your eyes away from him. He does need regular exercise, though, or he will get bored. And a bored dog is, more often than not, a destructive dog. Keep him challenged and happy, and you will have a well-adjusted dog at the end of the day who loves you to pieces. Previous post: The Great Pyrenees Temperament: (Patient, Affectionate): Do You Have Room in Your Heart (and Home) for This Gentle Giant?